Want to have an Adventurific time with Winnie the Pooh and Friends? Your kids will have a fun time imagining they are spending time in Merry Meadows jumping around with Winnie the Pooh and his friends; Tiger the Tiger, Kanga the Kangaroo, Rabbit, Eeyore and Little Piglet. 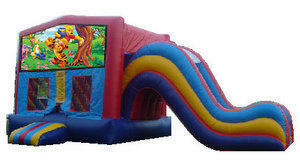 Bring all your friends and family and have a bouncing adventure!